“Out of the Water” (with photo of the Lost Souls), North Carolina Literary Review, #11, NC 2002. P 4E. “Arts & Entertainment” (with photo of Transitions), Times-News, Hendersonville, NC, March 3, 2002. P 4E. “Art Calendar” (with photo of Transitions), Asheville Citizen-Times, Asheville, NC, March 10, 2002. P.C9. “Feature Articles” (with photo of Transitions), Carolina Arts, Bonneau, SC. March Issue 2002. P.9. 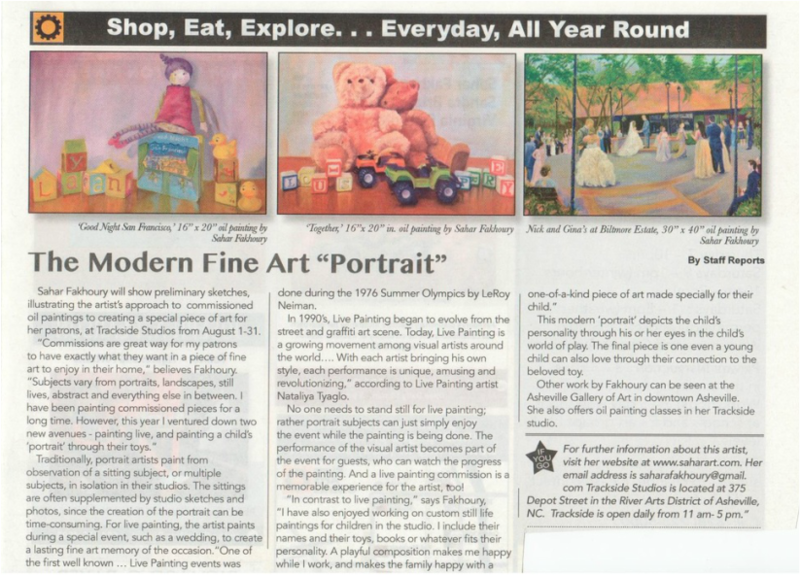 “Still Life Exhibition” The Arts Center of Henderson County News Letter, Vol 1. No.4, Hendersonville, NC, August 2000. P.2. Asheville Gallery of Art News Letter, (with photo of Unconditional Love), Asheville, NC, Fall/Winter 2000. P.4. “The Society” Alrai Alam Newspaper, Kuwait, March 11, 1989. P.6. “The Society” Alwatan Newspaper, Kuwait, March 10, 1989. P.5. “The Society” Alqabas Newspaper, Kuwait, (with picture of Boats and Past). Kuwait, March 10, 1989. P.4.